The Forest Glen Pedestrian Bridge provides a safe and accessible way to travel along Georgia Avenue and to cross the Capital Beltway I-495. I-495 crosses Georgia Avenue between Wheaton and Silver Spring very close to the Forest Glen Metro station. This intersection was very dangerous and on one side had 5 at grade crossings. The high frequency of commuters and locals who rely upon the Metro station and Georgia Avenue as a means of transportation was a major reason to construct the bridge. 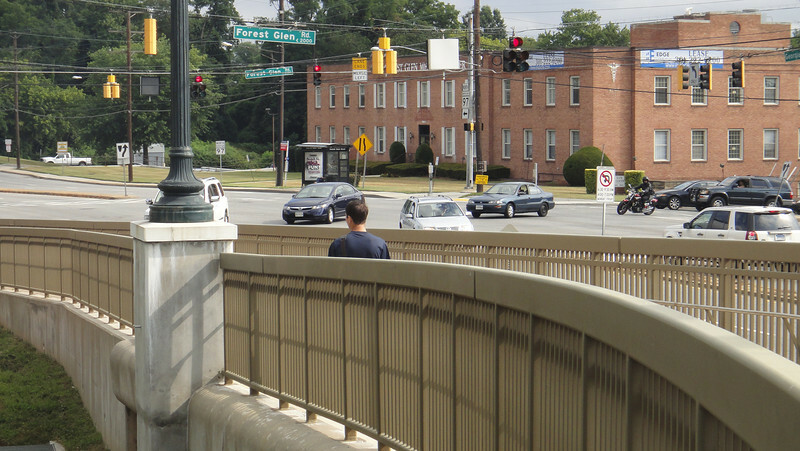 Furthermore the neighborhoods south of I-495 were cut off from the surrounding area by these unsafe crossings. Funding for the bridge was approved in 2000 and $2.878 million came from TE funding and another $2.878 million from local match sponsors. The project included the bridge which eliminated at grade crossing. The bridge crosses over two highway entrance ramps, two exit ramps, and goes underneath the beltway itself. This project is another link in Montgomery Countys continued efforts to build bicycle and pedestrian bridges at and around major regional highways including I-270 andI-495. Without TE funding, these crossing would continue to place commuters, walkers, and bikers in harms way.